Messier 45, The Pleiades or The Seven Sisters shows the wispy clouds of dust and gas, the nebulosity of the Merope nebula also known as Tempel’s Nebula. In this image, the star Merope is top right with the reflection nebula, star Alcyone (Eta Tauri) the brightest star in the cluster is centre most. The Pleiades (M45) is the most famous open cluster in the sky and sits in the constellation of Taurus (the bull) on its shoulder. In Greek mythology, the legend states that the sisters called for help from Zeus and when they were being pursued by Orion. Zeus turned them into doves and placed them in the sky. 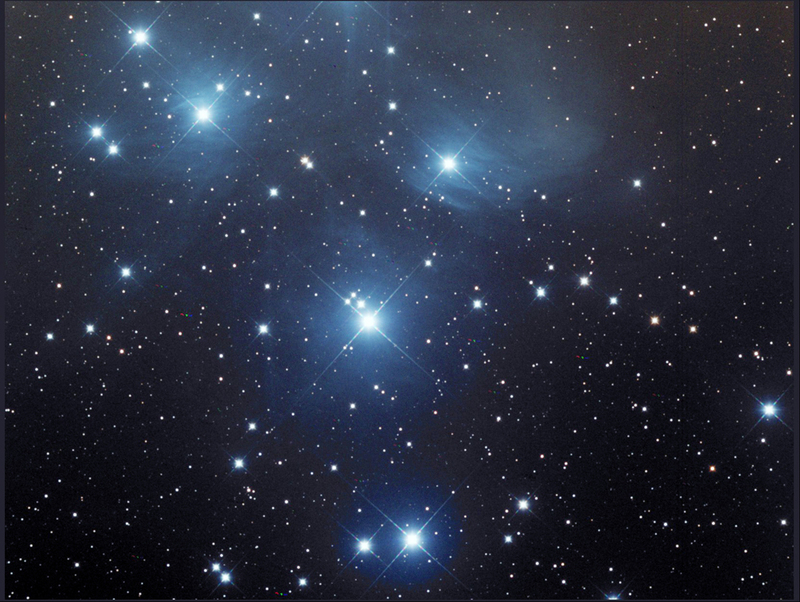 In a Native American tale, the Pleiades are seven youngsters who on a walk through the sky lost their way and never made it home. Japanese car maker Subaru gets its name from the cluster which is represented by six stars in its car badge. The image was taken through a 8″ telescope with 4 x 120 second exposures on Red, Green and Blue filters.